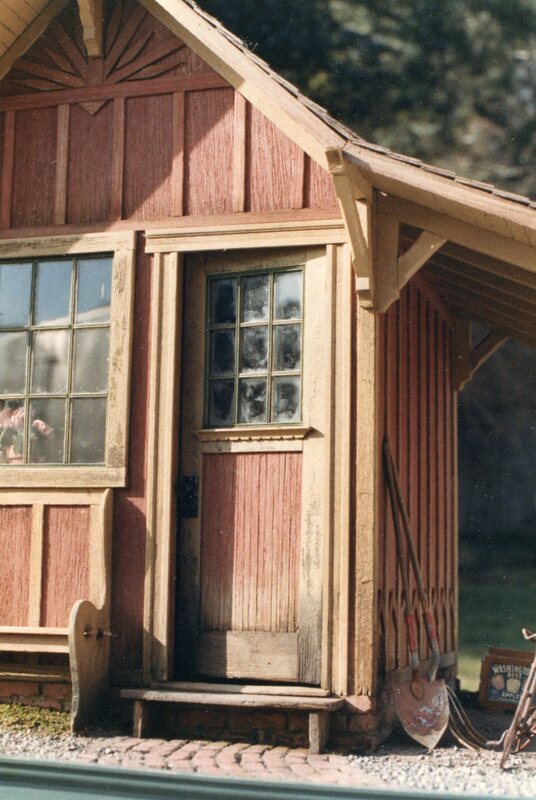 The Gardener’s Shed, project #33, marked the start of our official teaching career. Prior to that our “teaching” was more like the blind leading the blind, as those of you who took our early garage classes in Seattle can attest to. 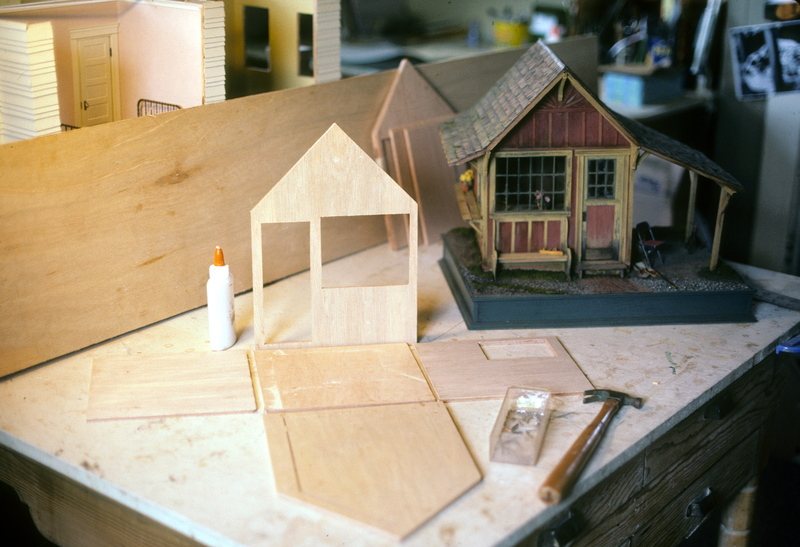 We taught without a detailed plan or instruction booklets, just trying to guide the students through the process of transforming a plywood shell into a recognizable, aged building. Then came our first year at the Guild School—1983. We were invited to speak and teach a 10 hour class. That class consisted of our providing each student with a sandwich baggie full of birdhouse parts, along with some paints and glue. On the way into setting up our classroom, baggies in hand, I paused when I saw the other teachers lugging in trunks and boxes of supplies, tools and teaching manuals, thinking, “Oh my, they’re awfully prepared. Teaching manuals?” Our students finished on day three of five, and we spent the last two days taking them on walking tours to point out aging details on the historic homes of Castine, ME, where the school was held. For some reason (possibly our “bird poo” demo ?) we were forgiven our haphazard approach, and invited back for the next year. We went home to build a better birdhouse. The better birdhouse turned out to be the Garden (or Gardener’s) Shed. It’s inspiration came from a reprint of the July 1891 Scientific American. 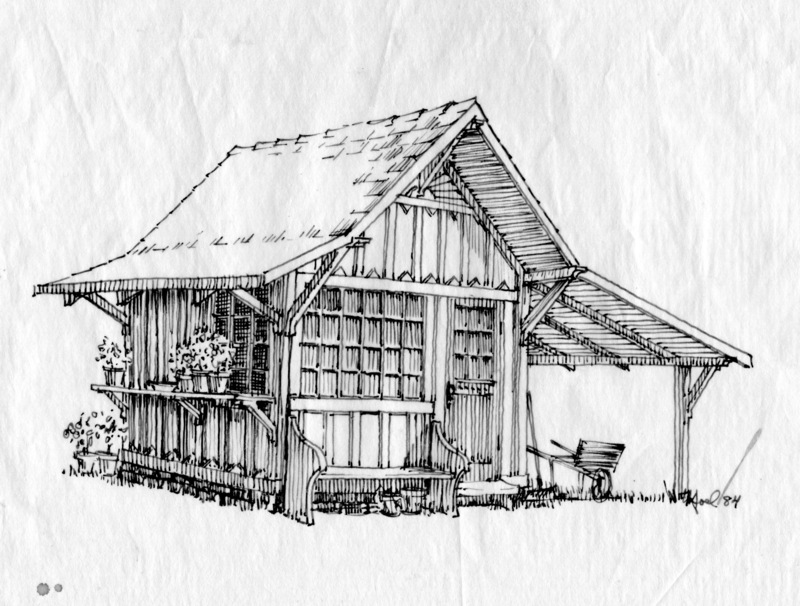 It’s a gardener’s dream—a potting shed deluxe in which to store one’s pots, rakes and hoes. It blossoms with amenities like lots of reflective glass, and a bench from which a tired gardener might listen to the birds and watch things grow. 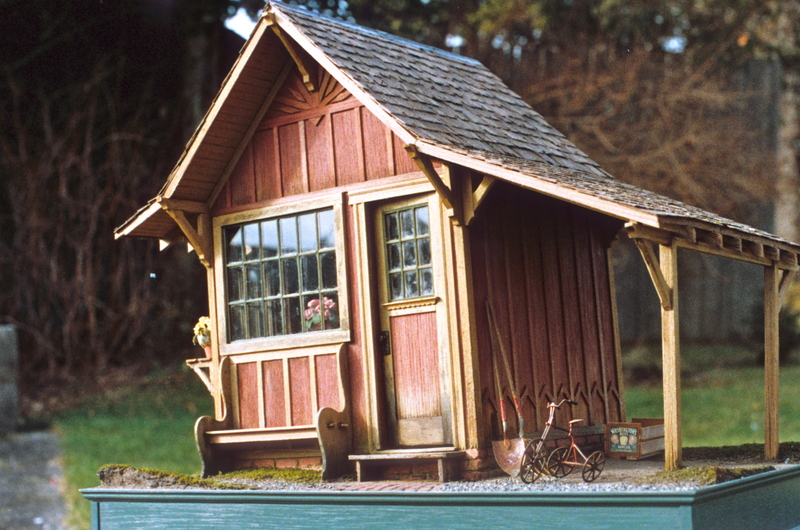 If it was out of reach for my life-size, postage-stamp yard and bank account, it was possible in miniature. 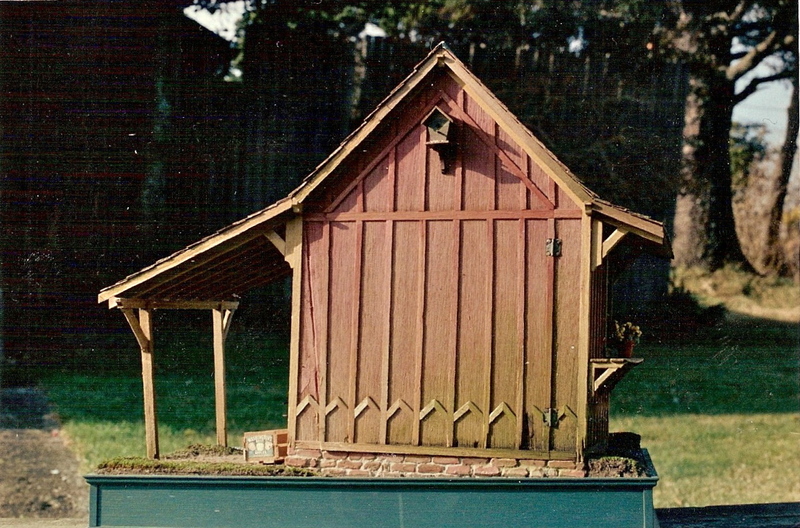 It also presented the perfect vehicle for teaching the illusion of age–slant, sag and rot–board-and-batten siding (simple enough for a classroom setting), bricking and shingling. It also seemed doable for a 5 day, 6-hour class schedule, though the only basis for that assumption was gut feeling—we’d make them do it in that time! Working hard on the second prototype–the first one sold to Noel’s brother. We arrived at the 1984 Guild School, somewhat confidently equipped with boxes, diagrams and booklets. However, as with any teaching situation, it’s the knots you never thought of that cause the most trouble. Shed roof detail, with tricky uprights. 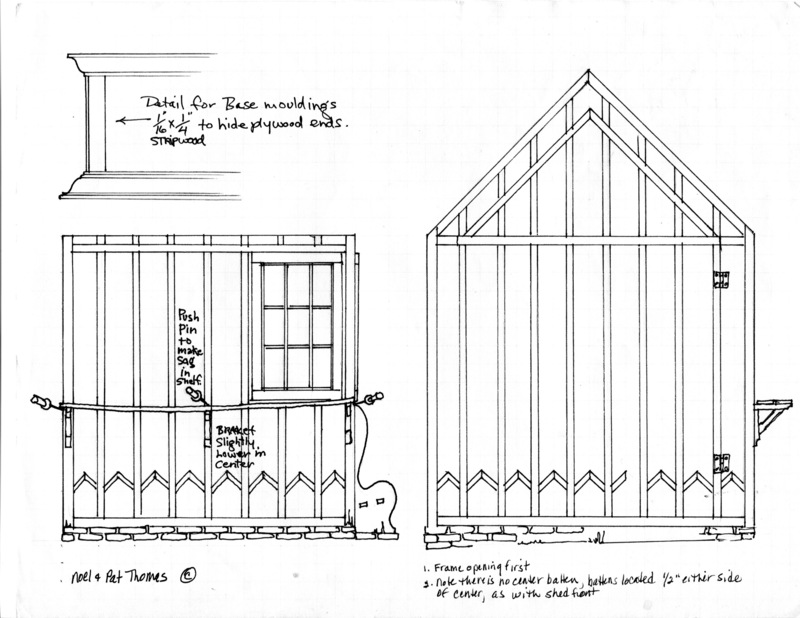 While we had pretty much ironed-out a method for the tricky chevron detail on our garage projects, we didn’t count on how long it would take a non-whittler to carve the multiple brackets with an Exacto knife (a whole class unto itself), or attach the uneven posts that hold up the shed roof. As with many future teaching projects, Noel took over such headaches in the last day or two, while I helped the class through the rest of the project. We always gave the student the option of completing all the work themselves, no matter how far beyond their skills, but in all our years of teaching, only two people accepted the challenge. Nobody needed to finish in class (and few ever did) but they did need the skills and materials to go home and finish on their own. What always cheered people up at the end was that everyone could shingle, and that was one of the final jobs. We still get photos from students who, years after their class, finally finished (the kids are gone!) the project. With wonderful results! Hinged back wall with birdhouse and chevron detail. Yes, bird poo was one of the lessons, for the birdhouse, and the Garden Shed. What roof doesn’t have a little, or a lot, of bird poo? 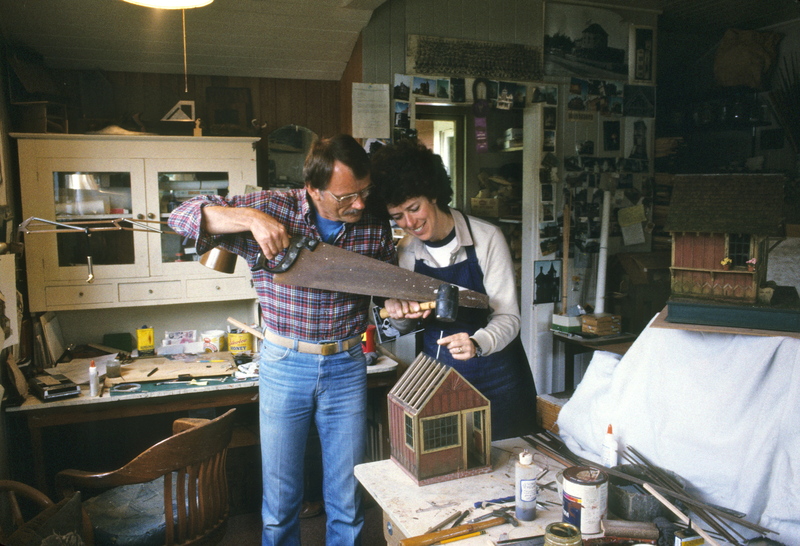 Our Artistic License dictates we use only a little—as with anything in miniature, and maybe art as a whole, a tiny suggestion drills a long way into the mind of the observer. You want to pique their interest, not bludgeon them with your new-found technique. Bird Poo 101 consists of dampening down the already aged (Bug Juiced) roof surface with a big drop of water on a small paint brush (a #4 watercolor round is good). A second brush (dry) is then dipped into titanium white acrylic paint. Dot a little blob on the dampened area. A tinier dot of raw umber or Mars black should be added for graininess, and/or some blue if it’s berry season. Finish it off with another drop of water from the first brush, dropped from just above the pile so it wets the whole slightly–enough to mix the colors a little and stain the area around the blob, but still keep some dimension to the blob. It takes a little playing with, but the end product, so to speak, is worth it. Unfortunately I cannot find a single photo that includes a close-up of bird poo. Another year at the Guild School we taught the popular Bird Poo Demo as a seminar. A student from South Africa, a fairly buttoned-down man, spent the whole demo at the back of the room with his brow furrowed. All I could think was that he was offended, but not so much as to leave the room. Finally, as we put the finishing touches on the “poo” his face lit up. “Oh,” he blurted in his rich English accent, “Fulmar! !” Fulmar presumably being their word for bird droppings. He applauded. Everyone applauded. Now bird poo had a class, and some class. 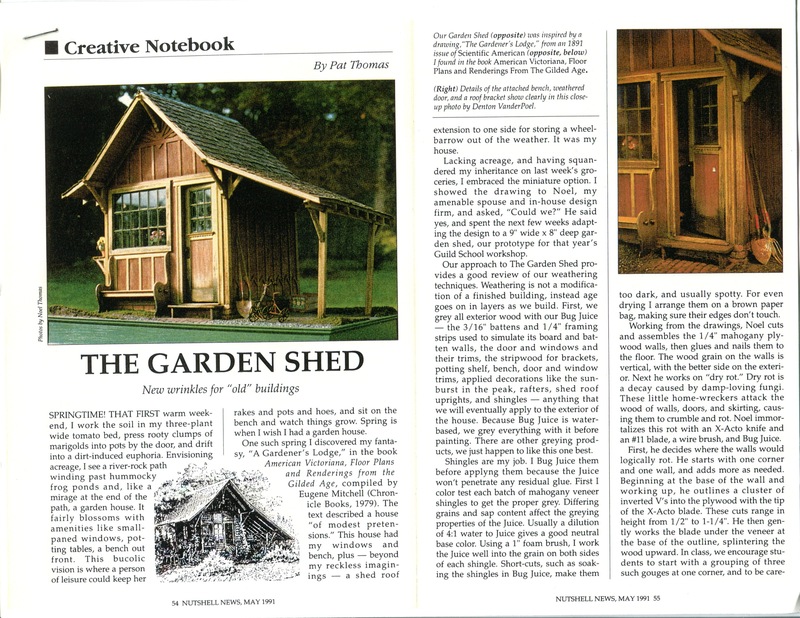 End Notes: For more detailed how-to’s on the Garden Shed, see my Creative Notebook entry in the May 1991 Nutshell News. Purportedly that series is still available by order from Dollhouse Miniatures. I am not allowed to reprint them myself, but any of you may copy and distribute them as you like. People subscribing to The Camp or other mini-chat groups might be willing to send you a copy. 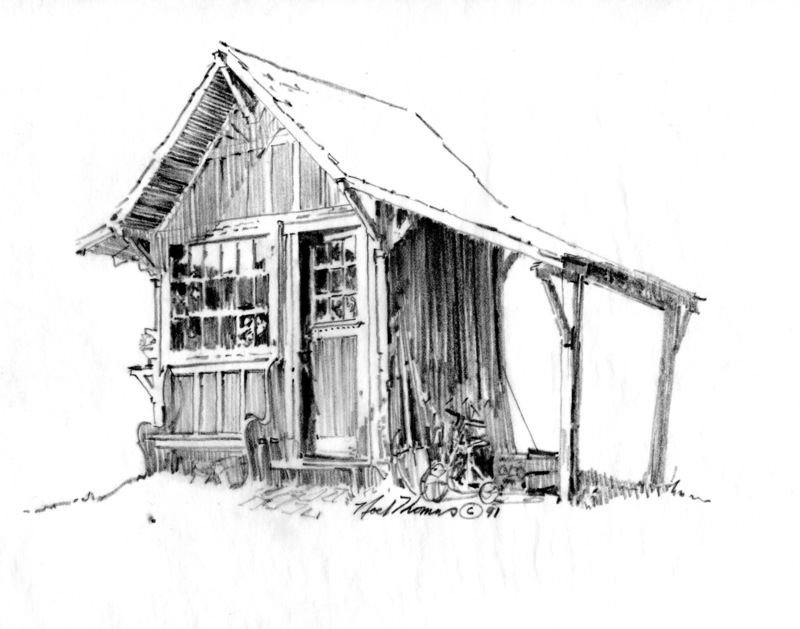 As of this morning, Sunday May 13, the Garden Shed is sold, and going to a wonderful new home! 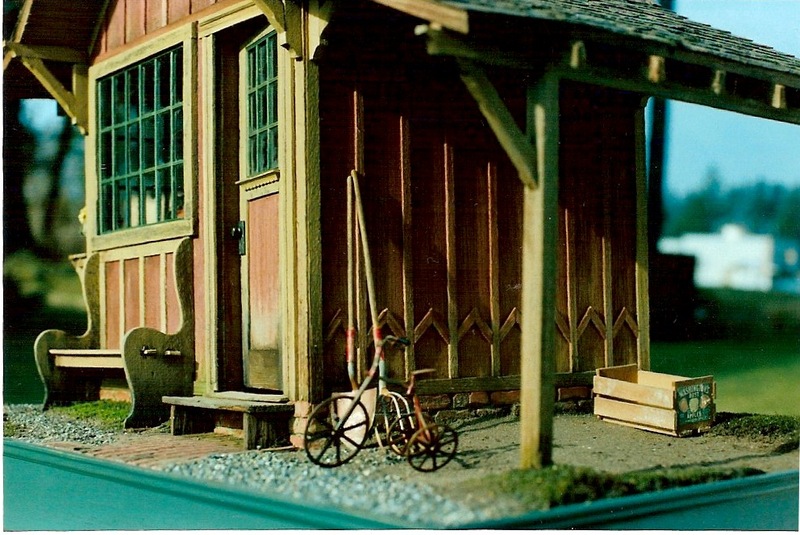 This entry was posted in Houses, Memoir, Miniatures and tagged architecture, arts, dollhouses, IGMA Guild School, miniatures, work style. Bookmark the permalink. good story! i cant ever remember a recipe for cookies but i will remember the one for bird poo! thanks! I still treasure my little birdhouse with it’s bird poo and the tiniest of feathers stuck to it. Too cool! LOL! ‘Fulmar’ is a sea bird which does leave lots if poo but never, ever, has it been an English expression for poo. The ‘proper’ word for bird ‘droppings’ is ‘guano’ which when built up in thick layers, as it does in sea bird colonies, has been collected throughout history as a very effective manure for gardens or small farms. Amazing what you learn through the world of minis isn’t it? !!!! Sheila, Thanks for pointing that out. I questioned it too, but found an Old Norse definition of “foul and unpleasant” for the front end of the word, and thought maybe that had made its way in to some colloquial version of guano for the colonial British in So. Africa (and decided all that was too much for the blog). But who knows–it seemed to be a word that satisfied the speaker! Well, I am South African and we definitely talk about bird poo or droppings, never heard the word “Fulmar” in all my life. I went to Guild School last year as a scholarship student and am looking forward to going again this year. Thanks for your blog, I enjoy reading about your journey. Always glad to have a local expert chime in! And please say Hi to Castine and the Guild School people for me, I’m feeling the tug.